What is better than a good breakfast sandwich? Not much if you ask us. Picture a crisp morning, you step outside your posh apartment, and take that first deep breath. Within mere minutes, you have access to a myriad of breakfast sandwich choices. You can have a delicious bagel sandwich at Etta. Scrumptious eggs on a brioche bun at Stone Way Cafe. The classic egg cheese and meat on an English muffin at Solistico. You can get it on bagel or toast at Lama G cafe. Check out this map, with our top choices. 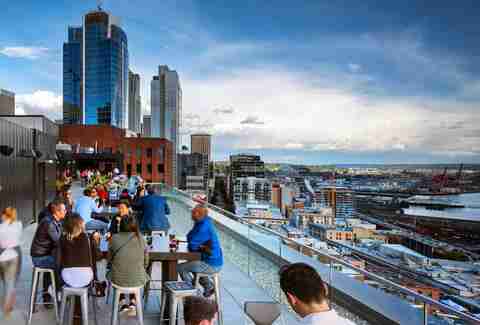 Summer is starting to wind down, but before it does, there is still time to enjoy a cocktail on a beautiful rooftop! 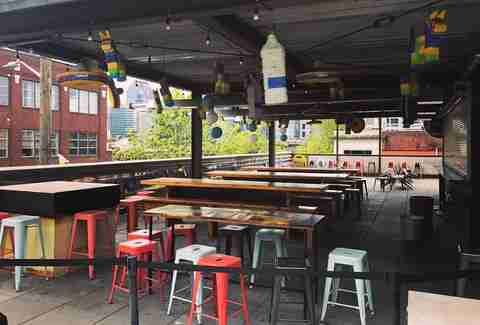 Here is a list of the best rooftops bars in Seattle. Thanks to Thrillist for putting this list together, and we hope that if you’re reading this, you will go and have a drink at each and everyone of these cool spots. Five stories above 4th Ave, in what used to be The Red Lion, this sprawling indoor/outdoor drinking destination is 4,000 square feet full of fire features, Gatorade-colored ping-pong tables, and plenty of summery cocktails — even when it doesn’t feel like summer out. 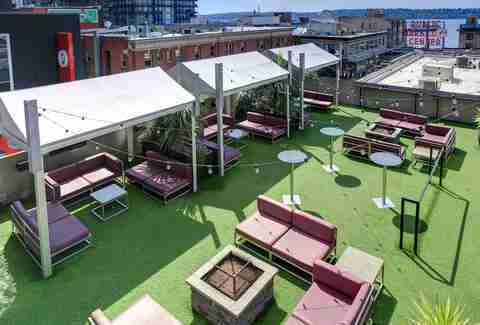 A welcome addition to this Vietnamese mainstay on the back side of Cap Hill, Monsoon’s roof deck makes the thing they do best — brunch — even better. Enjoy steamed BBQ pork buns, and some of the city’s best pho (get the beef round/brisket version) under the morning sun, while a breeze gently blows through the trees lining 19th St below, and the frustrated curses of people looking for parking under said trees recede gently into the background. Named after a pipe tobacco and boasting a slightly nautical theme, this neighborhood bar provides customers with a glorious array of fried foods as well as street eats from Three Keys, who are serving chicken & waffles, decadent cheesesteaks, and more from a window in the wall Monday through Thursday. 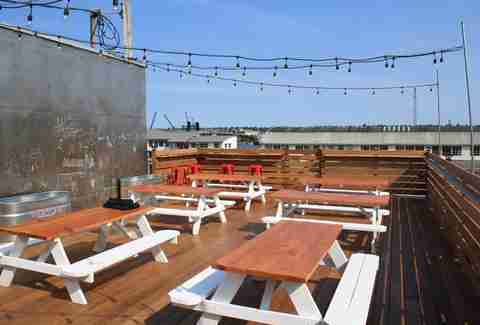 Oh, and CB’s also provides the perfect place to consume all that: a rooftop deck complete with views of Seattle’s skyline. Yes, it’s a Hard Rock. And yes, it’s mostly for tourists and out-of-towners who don’t know better. 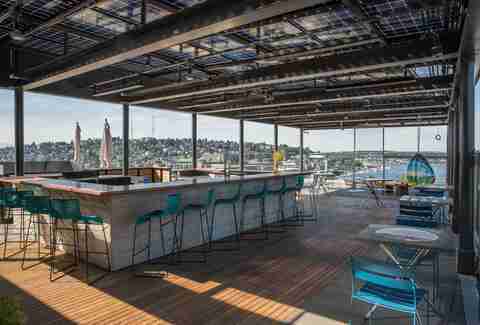 BUT it does boast a pretty phenomenal astroturf topped rooftop bar, complete with cabanas, a fire pit, and commanding views of the Pike Place, and Elliott Bay behind the market’s famous neon sign. 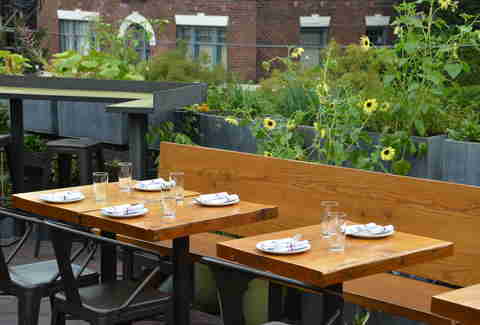 Everything on this stunning, triangular-shaped restaurant’s “earth to plate”-inspired menu tastes better when you’re surrounded by an edible garden, one story above the considerable fray of the always bustling Melrose Market. Especially the water buffalo burger, or the Monday Night Paella. 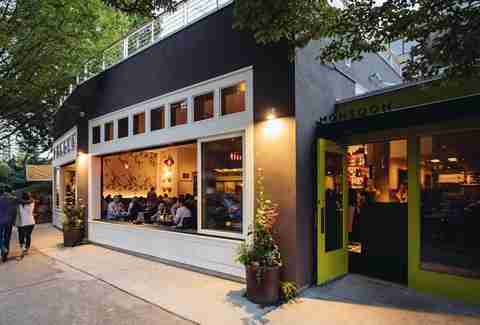 MO’s second, and much more sprawling location in Pike/Pine, features a sleek, mostly black bar inside and most importantly, a vibrant lounge on the roof. In either area you can expect to be plied with an almost endless array of margaritas and seriously delicious Mexican street food, including enfrijoladas that aren’t to be missed. Set away behind the mongers throwing fish in the Pike Place Market, it’s easy to overlook this charmingly authentic French restaurant… but it’s impossible to forget once you’re ensconced at a table overlooking the waterfront eating escargot in garlic & parsley butter. Like the rest of the beguiling Post Alley eatery on which it sits, this most unlikely of all Seattle’s rooftop decks is reached by going down a long staircase, though a trapeze-equipped dining room (they host burlesque shows at night), and out onto the patio which is both below street level and breathtakingly above what few streets remain between it and the waterfront, giving you the sense that you’re safely hidden away, and sitting on top of the world, at the same time. Perched atop the new Thompson Hotel, this 12th floor space serves a selection of snacks from the people behind Westward (skewered meats, mix-to-order poke, etc. ), as well as bottled and craft cocktails poured over house-made pieces of ice, but who are we kidding? You’re there to drink in the seriously stunning views of the city and Elliott Bay, which make this a can’t-miss destination. Helmed by the people behind Mamnoon, this 14th-story spot is accessed through a small street-level bar/waiting room. From there an elevator takes you to a short windowed corridor strewn with neon light that opens into a sprawling 2,800sqft space — two-thirds of which is outside — where, in addition to Middle Eastern fare from noted Seattle chef Jason Stratton, you will also enjoy unparalleled views of Seattle Center and the Space Needle, Queen Anne, and Lake Union just two blocks to the north. SEATTLE SEAFAIR! – It’s that time again! Get your boat, or get your friend who has a boat – and get out on the water. In order to fully enjoy Seattle for everything that it offers, you must attend Seafair! What began as a celebration of Seattle’s Centennial in 1951 has turned into one of the most iconic events that our great city offers. From The Blue Angles to The Hydro Plane Races, there is nothing quite like Seafair. Have you been to the Fremont Sunday Market yet? Every Sunday come see Seattleites in their natural habitat. They will be buying kale, squeezing fruit to test its ripeness, sporting mustaches and doing other quirky northwesty things. What started in 1990 now has 200 vendors bringing antiques, collectibles, bygones, retro, vintage, original fashion, tools, deluxe junk and estate sale treasures! There are eclectic street foods and gourmet food trucks for your belly’s enjoyment. The market is pet-friendly and always a good time! You never know what you might find! Every Sunday from 10am – 4pm – The Fremont Sunday Market is located at the corner of 3410 Evanston Ave North. Summertime is here, and you know what that means, FESTIVALS!!! Seattle is known for its music and here is a list of the best music festivals our wonderful city has to offer! Make sure you check out at least 3 this summer! Many are just a quick bus or bike ride away from the steps of Bowman! Now, if we here at the Bowman had to choose just one festival to recommend, we would want you to attend Bumbershoot. It is one of Seattle longest running festivals (since 1971), and this year the lineup is amazing! Just check out the bands below, and make sure you get your passes early, because it is sure to sell out! Make sure you enjoy your summer! Bowman Pet Contest – The results are in! Bowman’s first official photo contest is over, and the results are in! Thanks to all who played! C is for Cookie — Midnight Cookie Co. is OPEN! Fresh baked cookies, available until 3 am!. One of our neighborhood’s newest spots is Midnight Cookie Company, Seattle’s first late night cookie and ice cream delivery service! This local cookie parlor was founded in January of 2017 by two college buddies, with an insatiable love for cookies. It was their vision to provide late night satisfaction for the sweet tooth. They have over a dozen varieties of cookies, baked daily, including some unique speciality options like red velvet and smores! They also offer freshly brewed espresso and local Full Tilt ice cream in 9 flavors including salted caramel! If sweets weren’t enough, grab a seat on the couch and have a turn on their vintage video games. Last time we stopped in, people were enjoying some classic Super Mario Brothers on the SNES. They also have Mario Kart, when you want to hurl shells at your friends. Overall this place was amazing. Stop in on your way home from the bar, or after a nice meal for a fresh cookie. Have coffee and ice cream too, and you are feeling it – hit up a game of Mario, just watch out for Bowser. There are a lot of cool bars in Seattle, but only one that is packed with classic arcade games and vintage pinball machines! Add-a-Ball in Fremont is a great place to hang out before you hit the town, or as a final destination to end the night. They have cheap beer and great snacks. Test your dexterity and muscle memory from your days as a youth as you hurl fireballs at each other while playing Street Fighter 2. HADOUKEN! 36th and Phinney, open 2PM to 2AM every day! The Taco. This delightful dish often rolled in a tortilla, or packed into a crunchy shell is one of the world’s most cherished foods. Search far and wide, and you’re hard-pressed to find someone who will say they don’t like tacos. Rumor has it that the Taco was first invented in the 1800’s, in a Mexican silver mine. The miners used to pack gunpowder, twisted up in paper, and pack them into the side of the mountain to break it up so they could extract the silver. They would call these packs “tacos”. Tacos were always rolled up in flour or corn until the 1950’s. Aspiring entrepreneur Glenn Bell, conceived of a concept of a fast food taco chain, and he needed something that was quicker to prepare and had a longer shelf life than the soft taco shell. The crunchy taco shell was born, and an empire was created. #yoquierotacobell Glenn Bell couldn’t have predicted that his creation would be stretched to include Doritos and Fritos as a shell base – but we are living in a crazy world, so eat any type of taco you want because they say – you’re only young once. Here are a few of our favorite tacos in the neighborhood, make sure you try them all because you know – #YOLO. A few times a year we like to recognize our very special, often over-looked 4 legged residents. Abe “Stinkin” Lincoln has been roaming the halls of the Bowman, doing his business on the roof and the sidewalks nearby for about a year now. He charms everyone he meets with his adorable under-bite, and his shameless requests for belly rubs. Abe was a rescue from South California, he loves children and other dogs and is always ready for a play date. Abe is so hawt, that he even has his own facebook page. You are free to follow him, but don’t be offended if he doesn’t accept your friend request, he has a busy life. What are a few of your pet’s favorite things? Blankets, edamame, cat toys and eye rubs! If your pet could talk, what is one thing it would say? Plastic bags, shopping carts, vacuums, brooms, car rides, and everything in between. What advice do you have for the humans? Even though it’s a dog eat dog world out there, try to stay PAWstivie!